In the run-up to the parliamentary election in Spain, it was clear that it would be the role of the new parties which would determine the direction of the country. Since a coalition government was inevitably going to be the result, it will now either move Spain to a broader consensus or if legislative majority is too narrow, even greater instability. The voters gave the Conservatives a victory, but without a mandate. The restlessness of the electorate in the pace of reforms and general overall corruption in the political process, had made the outcome the most uncertain, since the end of the Francisco Franco era forty years ago. Just days before this pivotal election, nearly one out of three voters had still not decided which political party to support. Out of a pool of 36.5 million eligible voters, that is a sizable number. Going into the election, there were three possible outcomes. The ruling Conservative party the People’s Party (PP) winning in concert with the new liberal Ciudadanos (Citizens), still remains the most likely scenario. 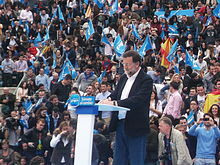 It combines the strength of the largest and the fourth largest political parties in Spain. Citizens is pro- business, but socially liberal. However, at this time none of the other parties included the liberals, will commit to a coalition government with the conservatives. The second possibility is a coalition between the Socialists which is the second largest political party, with the new anti-austerity party known as Podemos (We Can). This premise relied on Podemos founded in 2014, coming in a respectable third place rather than the Liberals which it has now done. The final result would be a minority government, which will lack a real mandate making the new government weak and most likely short lived. Such a government would be hard pressed to make additional reforms and would have difficulty remaining in power for four years. This result would make the two smaller parties able to maximize the most for concessions, in order to gain their support from the ruling government. It would also permit them the opportunity, to continue to poach voters from the two older parties. The problem for Spain is that the constitution as written, does not specify how soon a new government must be created after an election. It can be as long as two months according to the text. Therefore, the process could go on for weeks and could involve another election, if it becomes impossible to form a new political coalition. The political instability could also provide further ammunition for the separatists in Catalonia. 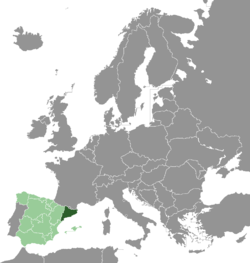 The drive for independence in this region of Spain, could totally derail the economic recovery. As the most prosperous area of the country, an independent Catalan entity would disrupt supply chains and business relationships throughout the nation. Fortunately for the Spanish people and for investors in general, some of the worst side effects of not having a new government in place immediately, will be somewhat delayed. The national budget for 2016 is already in place. Interest rates will remain low, with further stimulus on the way from the ECB (European Central Bank). Another impetus for economic growth in the year ahead, is the continuing decline in the price for international oil. The price structure is already reaching levels, not seen since in eleven years. International priced Brent will see losses for the third year in a row. It will be the first time this has happened, since exchange-based oil trading started in the 1980s. Many would agree a political stalemate, could be the worse outcome for the election. Spain possesses the fifth largest country in GDP (Gross Domestic Product) in the EU (European Union). The country can boast one of the fastest rates of growth on the continent, largely due to the economic reforms which were initiated by Prime Minister Mariano Rajoy. Spain is no longer in recession and is making progress with the stubbornly high unemployment rate, especially among the youth of the country. Yet, the overall joblessness rate is the second highest in Europe after Greece, coming in at 21.6%. Youthful unemployment is much higher at a staggering 46.5%. As a result, emigration from Spain is at a record high. It is the discontented youth of the country, that holds the balance of political power in their hands. The results on Sunday leave the country completely divided. In the 350 seat legislature, the ruling Conservatives (PP) were only able to hold onto 123 seats. That is just 28.7% of the vote. Their most likely coalition partner the Liberals (Citizens), received 40 seats with a vote percentage of 13.9%. Together this would add up to 163 votes. It is still shy of the 176 needed for a working majority. The Socialists (PSOE) captured 90 votes which works out to 22.0% of the total. If the party attempts a coalition with the now third largest party the anti-austerity Podemos it would still lack a majority in the legislature. 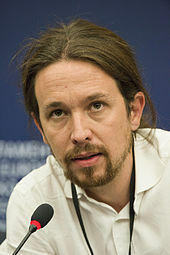 Podemos won 69 seats or 20.7% of the total vote. Together they are 17 seats short on taking control of the government. This leads both the left and the right dependent on the smaller parties, in any attempt to take control of the legislature. These mostly regional parties have 28 seats, which add up to 10.8% of the total. The two party system for Spain is likely a feature of the past. The Conservatives have paid a price at the ballot box, for making the sacrifices that were necessary to bring the economy back into balance. This recent election leaves them with a third fewer seats, then they had after the 2011 results. This is a loss of more than 60 seats, which equates to 3.8 million individual voters. The leadership of Europe continues to debate whether the recommended austerity measures has helped or hurt growth, in the heavy indebted southern states of the EU. Spanish voters have decidedly made a protest, as evidenced with the rise of Podemos. The results are much like what occurred in Portugal last October. It ushers in an era where a new consensus will need to be formed, among the parties in the legislature. 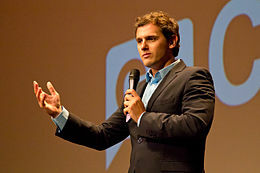 Portugal saw the left and the anti-austerity elements of the legislature unite in an improbable coalition, that was able to push out the ruling center right coalition. This occurred even though the latter on its own, had the largest vote share in the election. 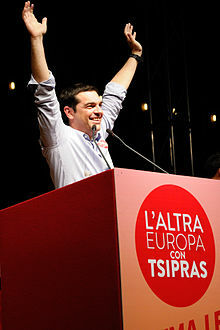 Tsipras in Bologna, Italy giving a speech for The Other Europe alliance. The financial crisis of Europe and in individual nations like Spain, brought to the forefront whether the modern welfare state was even viable in the 21st century. Although it has already been decided that there will need to be changes made to the present economic model, the political debate has moved onto how the costs were shared among the various segments of Spanish society. The corruption instilled in the Spanish version of crony capitalism, has doomed the dominance of the two older political parties in the country. Telling, the Greek Prime Minister Alex Tsipras congratulated the leader of Podemos on becoming the third largest political party in Spain. The rise of politicians like Pablo Iglesias a college professor and now the leader of Podemos, signals the end of traditional politics in Spain. The drama will now move to Italy, the last country in Mediterranean Europe with conventional party politics. The government there is under rising pressure, to make changes to the economic reforms being enacted. Prime Minister Matteo Renzi has watched his popularity decline as growth in Italy has continued to stagnate and the policies of austerity widens its reach. Regardless of the public protest in what previous government have agreed to, it does not change the reality of tight budgets and exploding liabilities. The anti-austerity movement will still need to balance national budgets, to satisfy financial markets and the EU leadership in Brussels. The policies of heavy spending on social welfare financed by high taxes and endless borrowing, is no longer a sustainable model. Individual nations have all agreed, to keep deficit spending to no more than 3% of GDP. 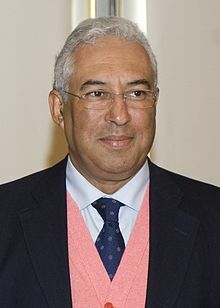 Evidence of this actuality was seen in Portugal, where the new government under Antonio Costa was forced to recommit to the fiscal targets previously set by the European Union. This is despite the electoral rhetoric of rolling back some tax increases and cuts to social programs. It is a repeat of what has happened in Greece earlier in the year. 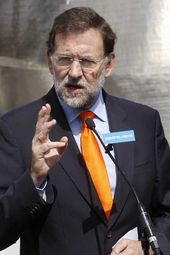 Prime Minister Rajoy faces a daunting task in assembling a new ruling coalition. The political uncertainty could well lead to a derailing of the economic recovery beginning in Spain. For now Spain has one of the fastest growing economies in the European Union. This could easily change if political instability brings economic uncertainty. The year started with a spurt of 0.09% in the 1st quarter. Expansion of 1% in the 2nd quarter of this year, was at an eight year high. Growth slowed slightly to 0.08% in the 3rd quarter. The main stock market index had already plunged 3.6% Monday, as a result of the elections the day before. The Socialists acknowledge that since the Conservatives did gain the largest vote share, they have earned the right to attempt to form a a new government. They also made it clear they would not provide any support to the effort. Podemos has also stated it will not engage in any coalition with the Conservatives. After the inaugural meeting of Congress on January 13th, the king of Spain will nominate a candidate for prime minister. This nominee must then win a vote of confidence in the legislature. If that effort fails, another candidate may then be put on the ballot for parliamentary approval. If that also fails and no government can be formed, the uncertainty of new elections after two months are unavoidable. The newer parties run the risk of having the electorate change their minds on earlier results. Spanish voters may well reconsider the fragmentation of their political process, in the next electoral cycle. The issue facing a new government will foremost remain the economy. However, other problems that concern the electorate include corruption, crony capitalism, regional separatism, social inequality and still punishingly high unemployment. These issues will stay daunting challenges to any new government that is installed in Madrid.